June feels a little early to be worrying about back-to-school shopping, doesn’t it? You’re just settling into a good summer routine and the kids are growing like weeds. That summer rain and sunshine and copious amounts of chlorine are working in their systems and each morning they seem just a little bit bigger. So why in the world would we go shopping for first day of school outfits?! Because food banks and children’s ministries need time to sort out donations, that’s why. Oh, and because Jesus told us to…kind of. So, the other day, I randomly got an alert on my phone from the My Parish app (which I don’t think has ever happened before). 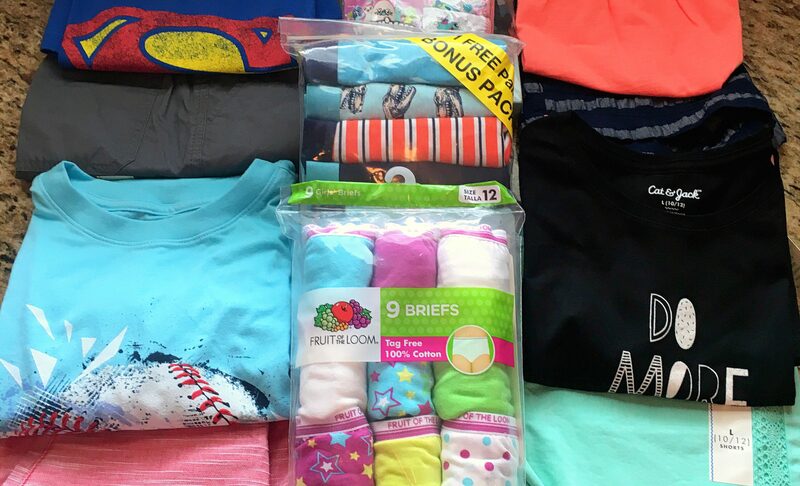 It said that the Food Bank was requesting new outfits, socks, and underwear in kids’ sizes 4-14. They hope to have enough clothes to provide each child who comes in to receive their backpack of school supplies with a new outfit for the first day of school. You see, our parish here in Jacksonville runs the Mandarin Food Bank. They provide all manner of services for people in our area from free food to family necessities, a clothes closet, and I don’t even know what else. Donations are always welcome, but at certain times of the year, the ask for particular items. They request turkeys at Thanksgiving, holiday foods around Christmas, school supplies in August. You get the idea. So there I was, eating a burrito at Moe’s with my 12 year-old son in between his dentist and orthodontist appointments. And I was stopped in my tracks. Our family is so blessed. 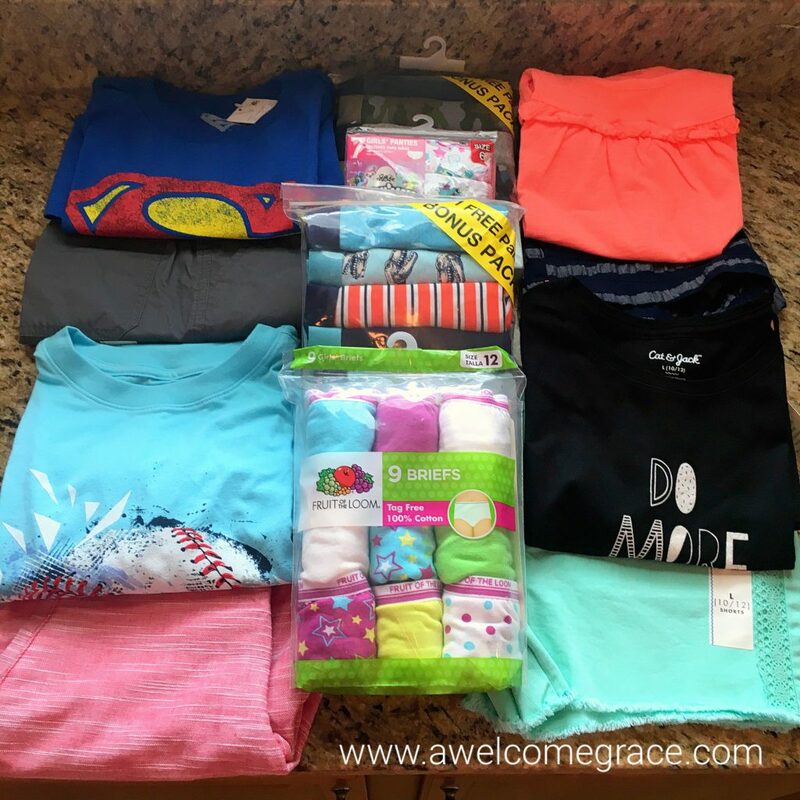 We certainly aren’t rolling in the piles of cash that fall off the money tree in our backyard, but we have never struggled to clothe our children. The Holy Spirit prompted and I knew we needed to do something. I showed the alert to Josh and asked him if he thought we should participate in the drive. He agreed as enthusiastically as a kid with a mouthful of burrito could and we made our plan. The next afternoon, all four kids and I piled in the van and we headed to Target. When we arrived, I gave them their mission. Much to the joy of my mommy-heart, the kids seemed super excited about it! With four stair-step kids, we were able to cover sizes S, M, L, and XL. Even 15 year-old, nearly 6′-tall Adam gladly shopped in the boys department to pick out something his 8 year-old self would’ve liked. It took us maybe 15 minutes and a fashion flub or two to have all the new things picked out and loaded into the cart. And, pardon the momentary mom-brag, no one asked me to buy one thing for them! Ranks right up there in the list of Times My Kids Made My Day, for sure. As planned, we delivered the new things to the Food Bank this morning. The kids were shocked to see so many cars in the parking lot when we arrived. Six year-old Lucy wondered, Is everybody dropping off new clothes, Mommy? No, baby. They’re here to get food for their families, food they can’t afford to just go to the store and buy. The concept was totally foreign to her. The woman at the clothes closet who received our donation couldn’t have been more gracious or thankful if she had tried. She totally made over the kids and their gifts and said she just had to show them around and introduce them to Ms. Bonnie, the director. As we wandered through the inner workings of the food bank, we saw the baked goods and fresh dairy and produce donated by local grocery stores. We saw shelves upon shelves of nonperishables and the beautiful volunteers who dedicate their time to feeding the hungry. My kids’ eyes seemed to get wider with every step. When we got to Ms. Bonnie’s office, she thanked us profusely and reiterated that hundreds of kids will be served by the back-to school drive. We promised that when we did the mega shopping trip before school started, we would certainly remember to get some items for them and that we would be back very soon. It was such a gift to all five of us to be shown around and made aware of the needs of others. I could tell how touched their young hearts were by how quiet the ride home was. I know that each of them was processing what they saw in their own way. feeding the hungry, sheltering the homeless, clothing the naked, visiting the sick and imprisoned (…) burying the dead (and) giving alms to the poor. Obviously, some of these things are easier to do than others, right? It’s plenty easy to throw some money in the bell-ringers’ buckets at Christmas time or send in the excess from your pantry when your kid’s school is having a food drive. We take part in burying the dead not by literally digging a grave, but by planning for or attending a funeral. Have you ever visited someone in a nursing home? Maybe you’ve come to sit with a new mom who can’t leave the house? Then you’ve visited the sick and imprisoned. But what about sheltering the homeless or clothing the naked? Those seem a bit tougher, don’t they? When I was little, my dad was out of work for a while. We couldn’t afford to keep our house running anymore. So my parents shut the place down and my mom, my sister and I moved in with my grandparents while my dad went in search of a job. Guess which work of mercy my grandmother and grandad showed to us? We may not have been homeless, but we certainly needed the shelter they so graciously provided. By taking my kids shopping and then donating their finds to the Food Bank, we were able to fulfill a Corporal Work of Mercy. They don’t necessarily look at it that way, but I’m hopeful that a little bit of the grace they received from doing so will stay with them as they grow. That maybe someday they’ll do this on their own instead of needing to be prompted by their old mom. Doing things for the Lord and for our fellow man doesn’t always mean doing something big and scary. It may not even seem like a really big deal to you. But don’t forget that what you see as small or insignificant can mean the world to someone walking a different path. Remember, God sees Works of Mercy even in multi-packs of undies. Beautiful, Beth. As always you are such an inspiration. Your heavenly cloud just got a little fluffier today.